Q10 contributes to the enhancement of quality of life like few other substances. The stabilising effect of Q10 plays a significant role. Without Q10 there is no production of energy and therefore no life. A strong immune system is also inconceivable without Q10. If there is sufficient Q 10 in the body it is stored where problems and strains occur, and in this way it builds a strong defence. The positive effects of Q10, which have been discovered in many investigations, show that a healthy body is also reliant on a sufficient supply of this coenzyme. This is why coenzyme Q10 is finally becoming more and more popular as a nutritional supplement for us. Q10 is extremely effective as a antioxidant and ensures that the body is detoxified by destroying free radicals. This coenzyme is thus vital as an absorber of free radicals and a supplier of energy. It accelerates the biochemical reaction in the body and in this way ensures continuous energy production. The organism is well accustomed to Q10 as it is a substance produced naturally in the body. There are no side effects when used in normal doses. 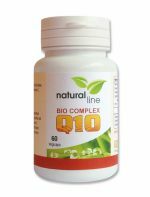 Even additional intake of Q10 has no effect on the body's own production; the stores are simply topped up and the body is supported in its natural production of Q10. The body has an increased use for Q10 when under particular strain, such as sport and exertion. It also requires more Q10 during physical stress and illness, as well as in cases of an unhealthy lifestyle such as smoking or the consumption of alcohol. The body's ability to produce Q10 itself also decreases substantially with age. From the age of 40 organs already show 30% fewer Q10 coenzymes than a 20 year old person. Many scientific studies show that many bodily functions are already substantially affected when there is a Q10 deficit of 25%. Therefore regular intake of Q10 coenzyme on a daily basis should be considered as a sensible supplement to daily nutrition from the age of 40 years onwards, at the latest.